Do you want to equip yourself with the knowledge necessary to succeed in the Information Security job market? If so, you've come to the right place. 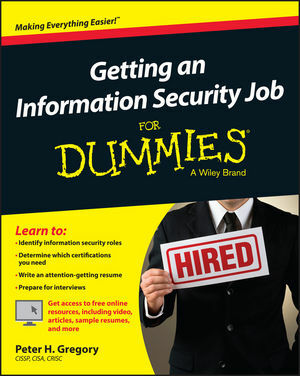 Packed with the latest and most effective strategies for landing a lucrative job in this popular and quickly-growing field, Getting an Information Security Job For Dummies provides no-nonsense guidance on everything you need to get ahead of the competition and launch yourself into your dream job as an Information Security (IS) guru. Inside, you'll discover the fascinating history, projected future, and current applications/issues in the IS field. Next, you'll get up to speed on the general educational concepts you'll be exposed to while earning your analyst certification and the technical requirements for obtaining an IS position. Finally, learn how to set yourself up for job hunting success with trusted and supportive guidance on creating a winning resume, gaining attention with your cover letter, following up after an initial interview, and much more. If you're a student, recent graduate, or professional looking to break into the field of Information Security, this hands-on, friendly guide has you covered. Peter H. Gregory, CISSP, CISA, CRISC, C|CISO, CCSK, QSA, is a director of strategic services at a national security consulting firm and the author of over thirty books on security and emerging technology. He is an advisory board member and lead instructor at the University of Washington continuing education program in information systems security.